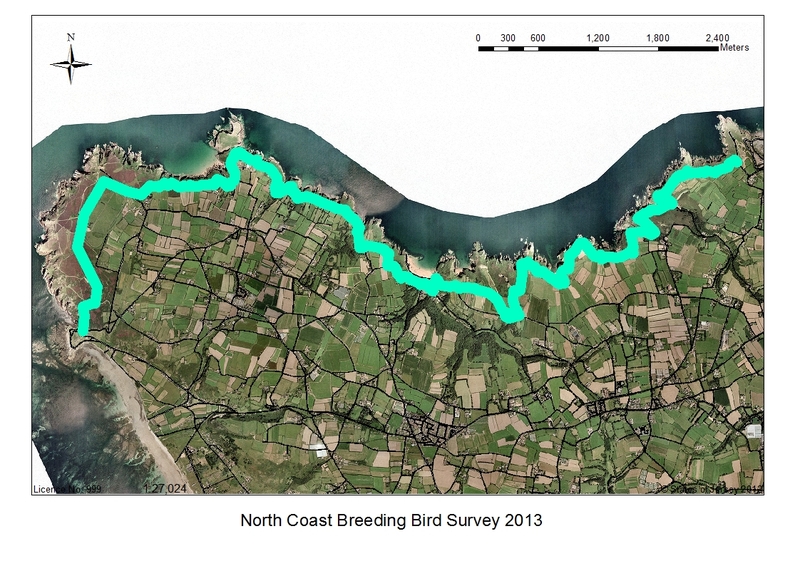 As you may remember, the North Coast Breeding Bird Survey was started in 2013 running from the late spring until the end of September. Its aim was to determine the number and location of breeding pairs of species of conservation interest. The list of target species comprised of kestrel, peregrine falcon, jackdaw, raven, skylark, common whitethroat, Dartford warbler, stonechat, meadow pipit and linnet. For this purpose BOTE gathered information from ongoing schemes such as the Farmland Bird Monitoring Scheme and the BTO’s Breeding Bird Survey squares, and filled in gaps by surveying areas with no existing coverage. With the exception of Les Landes (SSI), which encompasses an extensive area of suitable habitat, the survey was restricted to a narrow strip along the coast. 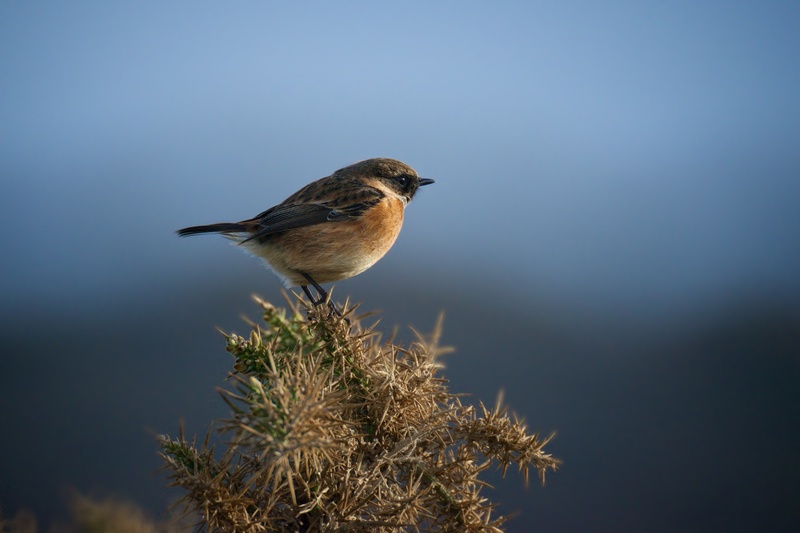 Most observations were taken from the coastal path; information was recorded regarding territories and behaviour such as singing, territorial displays, nest-building and food delivery to the nests. 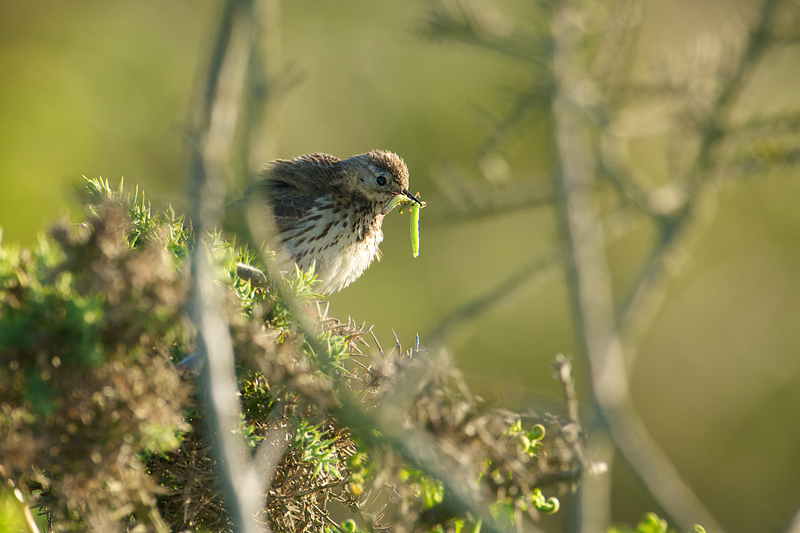 The results of the survey did paint a worrying picture for some of our farmland birds such as the stonechat and meadow pipit as fewer were found than was hoped for. The location of their territories was consistent with a combination of the right habitats for nesting and foraging, be it a cliff side, a hedge, an open field or a grassy boundary, yet it was hoped that their breeding success would be higher, especially as some pairs did not seem to succeed in their breeding attempts. 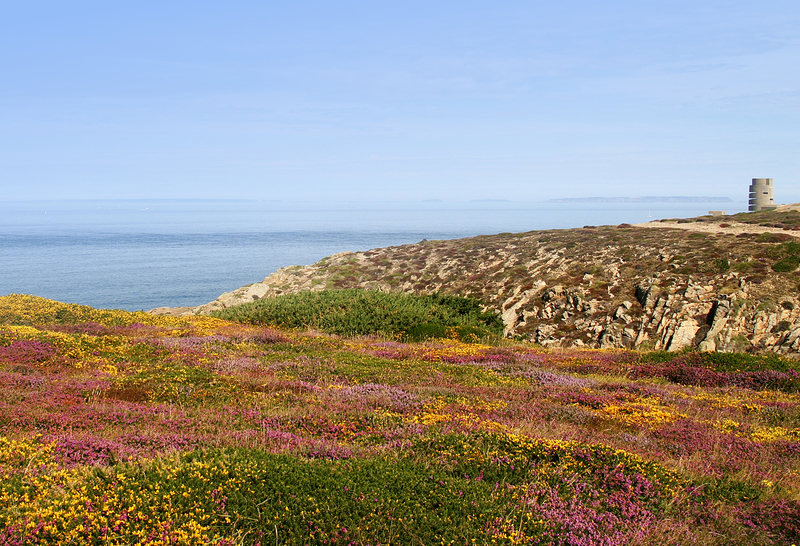 It was no surprise that most breeding territories were found within Les Landes SSI, which holds the largest expanse of maritime heathland in Jersey and has been under conservation management for over a decade. Not only is Les Landes the present stronghold for stonechat and meadow pipit, it is also the last site within this area where skylark bred until recently. Other species of interest to BOTE such as yellowhammer have been absent from the area for many years and, as expected, none were found during the survey. Whilst farmland birds seemed to cluster in particular areas, territories of cliff-nesters (kestrel, peregrine, jackdaw and raven) were relatively well spaced from each other. So how did the species fare? 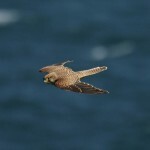 Most of the six kestrel pairs found in Area 1 are likely to be cliff-nesters. The kestrel is categorised as amber (decline by more than 25% but less than 50%) on Jersey’s bird redlist Conservation Status of Jersey’s Birds 2011 (read here) due to its low numbers, which have, however, remained stable over the last decade. 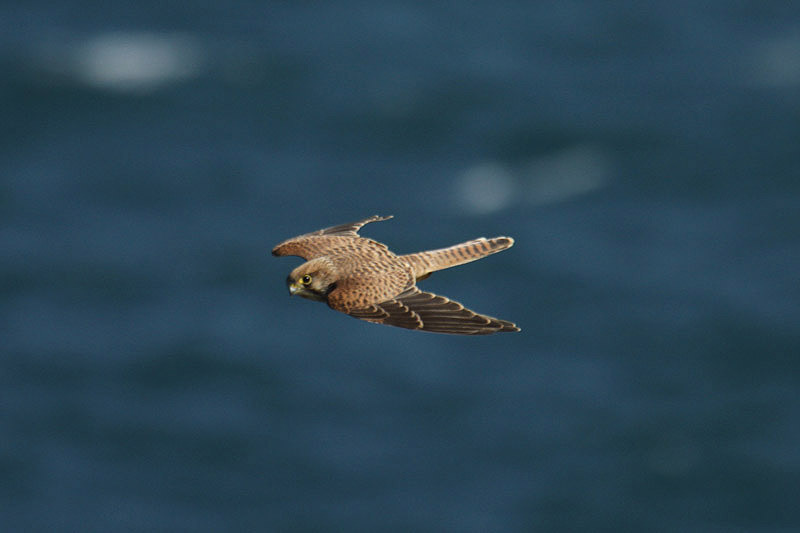 2013 was a difficult year for kestrels that breed in nestboxes and similar problems may have occurred for those nesting in cliffs. Over he last decade the number of breeding pairs in Jersey has seemingly reached a plateau at 5-6 pairs. The two breeding territories found in Area 1 are consistent with data from 2011 and 2012 collected by the Société Jersiaise’s Bird Section. The Jackdaw has green status on the redlist as numbers have locally been increasing over the last few years. The territory located, albeit with unconfirmed breeding success, could be the first of others in this area if the expansion of the species continues. The raven population in Jersey appears to have remained stable at around five breeding pairs over the last decade with only small fluctuations in the number. This species is, however, given amber status because the population is very small and, therefore, vulnerable. The single breeding pair found reflects this species’ preference for very large territories. Skylark is red listed (severe population decline in the Jersey population of more than 50% over 20 years) and there are no data on breeding attempts in the area since 2010 and the species is losing ground at the only other known breeding sites in Jersey (Les Blanches Banques and the Airport). The annual skylark survey conducted at the Airport since 2006 shows a steady decline in the number of singing males and in overall numbers. There are no previous data on this species for this area; however, the five pairs located were less than was initially expected. This species is not considered threatened in Jersey and was green listed in 2011. The population typically fluctuates between 40-45 singing males but can drop after a very cold winter. An Island-wide breeding survey in 2012 detected 13 breeding pairs in the survey area, but only five of these were found in the 2013 survey with another three pairs whose breeding success could not be confirmed. This species is a good community indicator through its dependence on mature heathland and gorse habitats. The overall decline of this red listed species in Jersey in recent years has been alarming, having dropped from five pairs in 2011to three known pairs (two of them at Les Landes) in 2013. Of these only one succeeded in breeding. 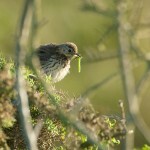 Meadow pipit is on the Jersey amber list and the six pairs located in the survey area was perhaps less than was expected. This species is amber listed in Jersey and, whilst there are no previous breeding data for it in the area, the seven pairs located were also less than expected. The available data suggest that the number of breeding pairs of the surveyed species is not increasing in the survey area, with the exception of perhaps only jackdaw. Skylark has disappeared from the area and stonechat may soon do likewise while Dartford warbler, meadow pipit and linnet might be decreasing. The trend in kestrel, peregrine falcon and raven are not so clear. 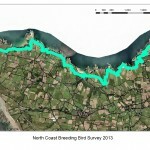 Birds On The Edge hopes to repeat this survey over the next few years and to expand the survey area towards the west coast of Jersey. Only long-term monitoring can provide a reliable picture on population trends and can help steer habitat conservation efforts.